Flowguard’s bladder-type vessels are ideally suited for applications as Pulsation Dampeners but are also commonly used as Surge Absorbers and Thermal Volume Compensators. They feature maintenance friendly top access for quick and simple bladder removal and replacement on site. Standard (shell) materials are 316/316L Stainless Steel, Polypropylene or Polyvinylchloride (PVC). Vessel bodies in other materials such as Carbon Steel, Alloy 20, Hastelloy C, Duplex Stainless Steel, Titanium, Monel, AL6XN and PVDF (Kynar®) are also available. Standard bladder materials are supplied in Nitrile (Buna-N), EPDM, Viton (B), Viton (GF), Peroxide-Cured EPDM, Neoprene, Epichlorohydrin, Hypalon and Butyl rubber. Food grade elastomers with an FDA certificate are also available upon request. Designs are available in pressure ratings to as high as 1,380 BarG (20,000 PSIG). Screwed or flanged connections and a choice of single, twin or multiple porting is available. Thousands of these dampers installed worldwide testify to the effectiveness of this simple design concept in smoothing the flow from reciprocating pumps. DS, DV and DP model dampers are only supplied with IOM and Pressure Test Certificates. These units are normally available in stock or with short lead times. 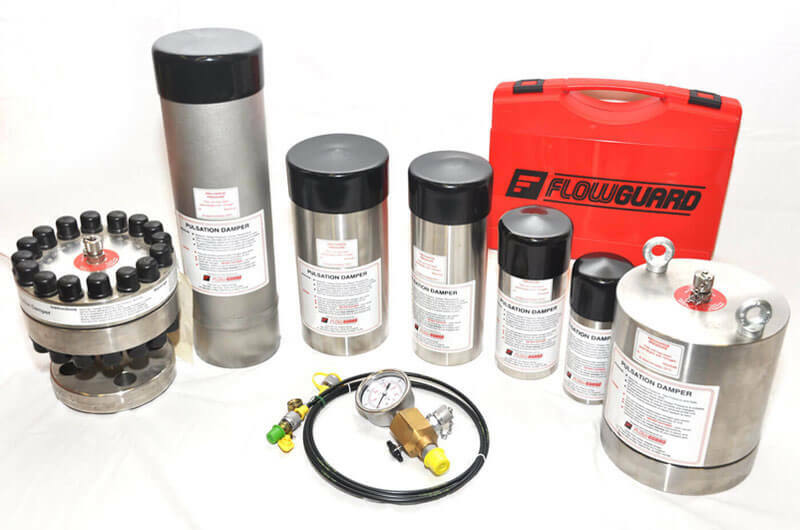 FG and HG models are supplied with full, comprehensive data books, including: Design Calculations; Material Test Certificates; Hydrostatic and Pressure Test Certificates; Certified Outline and Dimension Drawing; Welding Qualifications and Procedures (if applicable); and IOM, as a minimum.